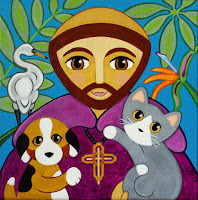 St. Thomas of Canterbury, Kenmore north of Lawrence: "In honor of the Feast of St. Francis, we will celebrate a Pet Blessing on Saturday, October 1st at 11am in front of the church. You are invited to bring your pets (all species welcome!) for a blessing. We will have treats for cats, dogs, and humans too!" St. Ita Catholic Church, Broadway and Catalpa: "The Blessing of Pets will begin at 12pm on Saturday, October 1st in the School Playground, entered off of Magnolia. Also in attendance will be Care for Real, your local Pet Food Pantry, and Sit Stay Read ‐‐ a program that uses Certified Reading Assistance Dogs to increase literacy skills in low‐income families and students." All Saints Episcopal Church, Wilson and Hermitage, will have pet blessings at the 9am and 11am Sunday worship services on Sunday, October 9th, with an adoption event at 10am. "All creatures great and small are welcome." St Mary of the Lake, Buena and Sheridan: Unknown. Usually St Mary's has animal blessings on the church steps on the Saturday prior to October 4th at 5:15pm. They usually put it in the church bulletin and have a banner on the church fence. This year we have been unable to find any notice of the traditional event. If you know any more details, please let us know. Pet blessings are non-denominational and neither you nor your pet need be affiliated with the church at which the blessings are given.